Body & breath work at your desk, in your suit – or on the mat, in your gym gear. Why do we come to offices? We come to you, so you don’t have to travel anywhere for your yoga class. Today’s working world is busy and hectic for everyone. We’re all stressed, be it down to work load, urgent and conflicting deadlines, challenging colleagues or clients, frequent travel, uncomfortable chairs, irritating commutes, combining work and family – you name it. It can be hard to find the time or muster the discipline to do any exercise at all. Our aim is to improve companies’ corporate health and wellbeing by making your working day easier and more efficient. 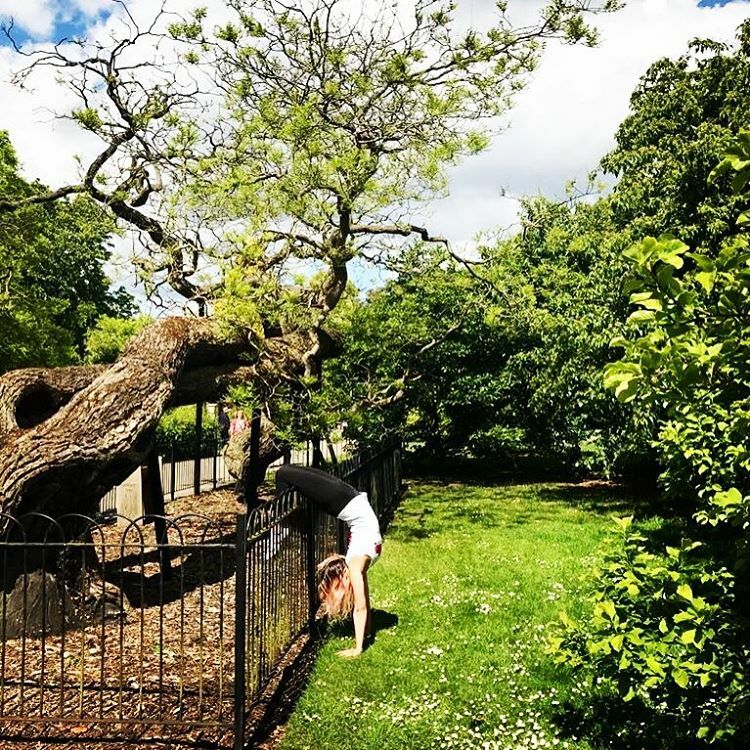 Unfortunately and undeservedly, yoga carries a lot of prejudices and a particular teaching style can really put you off. We strongly believe that you just have to find a yoga teacher who suits you, and you will love it. We’re not up in the clouds but down to earth and we look forward to seeing you there. 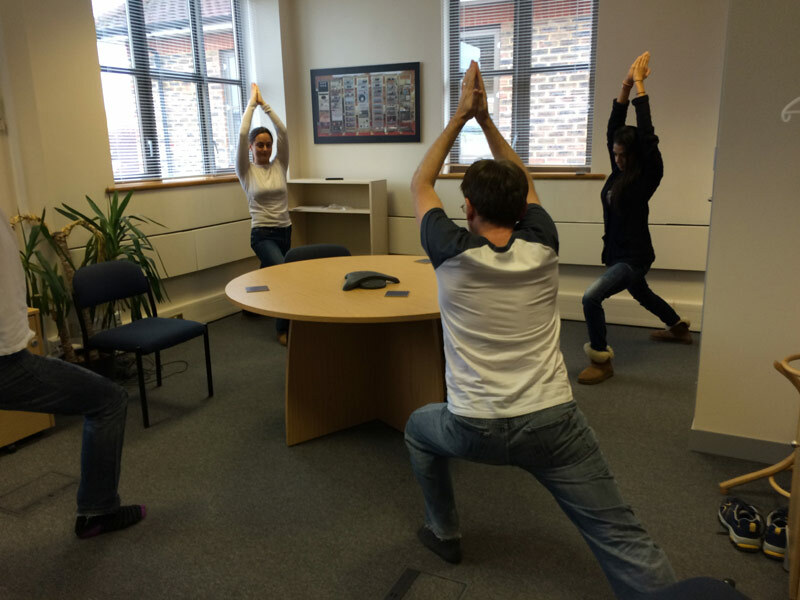 We combine different types of yoga and adapt some traditional exercises to the office environment. We also teach Pranayama breathing, an important part of Hatha Yoga. Pranayama can be translated as “control of breath” or “extension of life force”, and it is a scientifically proven method of treating, as well as preventing stress-related disorders. Hence, it complements the set of physical exercises perfectly. 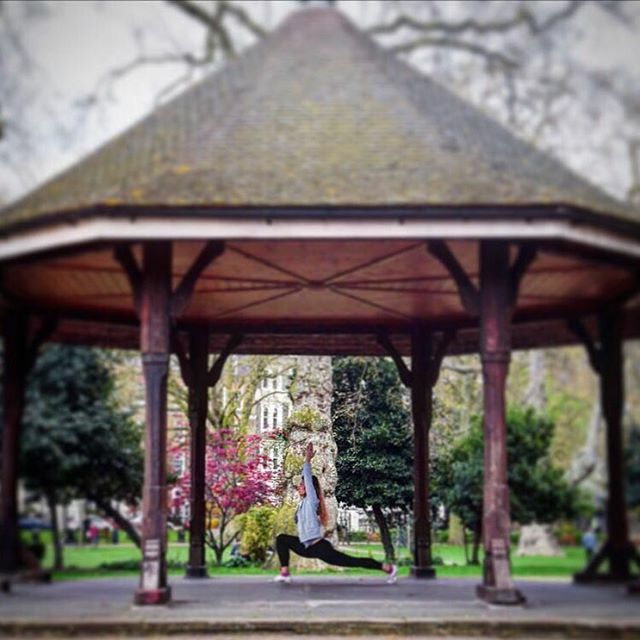 We make sure everyone gets the most out of our classes, whether you’re a yoga novice or consider yourself a pro. We promise we won’t waste your time telling you how beautiful your inner self is but will focus on the fact that you may have been sitting at a desk for eight hours straight or have just come out of an exhausting meeting and need to relax, unwind and give your back a break. We also offer mindfulness-based meditation both as part of our yoga classes and as standalone session. Why would you want yoga at your desk? Because it’s easy, convenient and good for you! 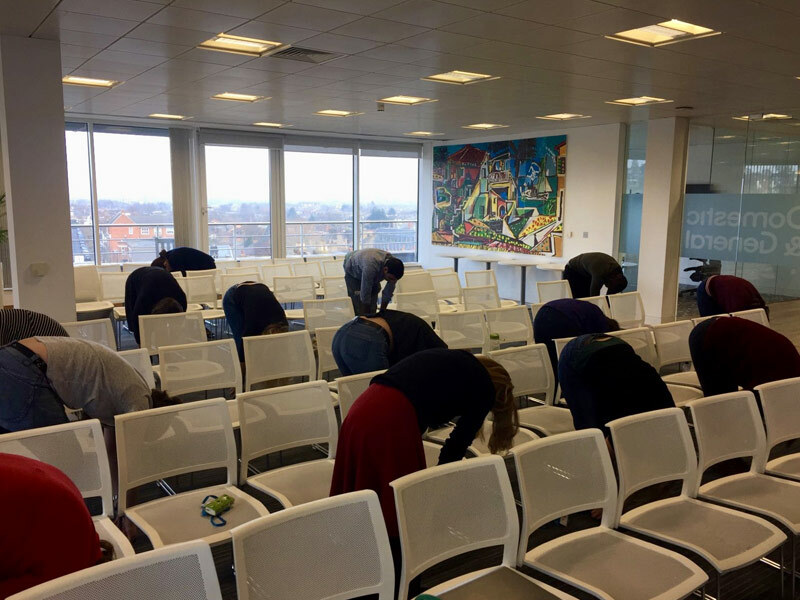 We can work anywhere – try our desk yoga, chair yoga, or give us an empty room or any other space. And if your meeting rooms are always booked, don’t worry: we do open-plan office yoga and all you need is an arm’s length of space on each side. 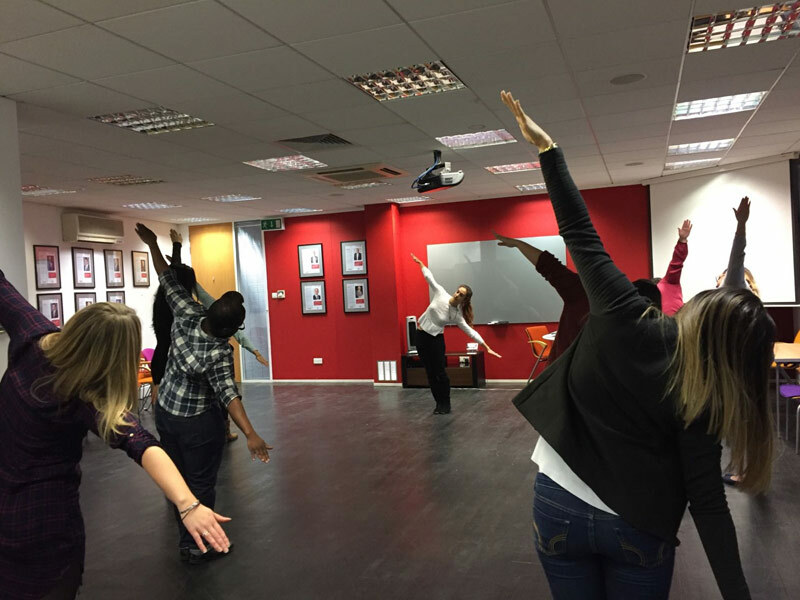 For our office yoga sessions, we have specially adapted exercises, so don’t need any yoga mats, yoga chairs or other props and no one needs to get changed out of their normal business attire. We’ll adapt our sessions to your company’s needs and can teach from 30 minutes upwards. We start and finish promptly so it can become a short and sweet part of your workday. Yoga improves strength and flexibility, works your muscles without causing pain and reduces mental and physical stress. It builds concentration and promotes a positive way of thinking and living. All of this leads to better health and productivity, with relaxed employees doing the best job possible for their companies – and themselves!